We have partnered with the leading manufacturers to provide the best quality and price. 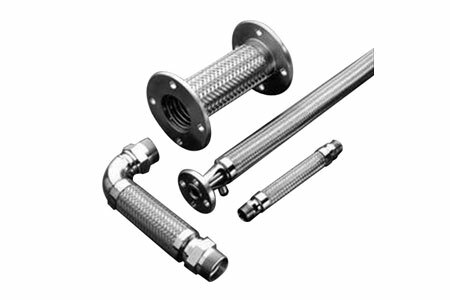 Bulk hose or hose assemblies are readily available. Our assemblies are crimped (1/4″ to 4″) to provide the safest product for our customer base. We offer metal hose and welded metal hose assemblies when a rubber hose is not practical. Many different types of metal hose are available depending on the application. Criteria to consider is pressure, flexibility, and chemical compatibility. Corrugated metal hose is an excellent choice for high pressures and is gas tight. This hose is commonly used for gas and liquid transfers. Stripwound metal hose, although not gas tight, is excellent for an open ended exhaust hose, transferring dry bulk materials, and as a guard over other types of hoses. Many different fittings are available for our assemblies including male pipe, female unions and couplings, sanitary flanges, slip-on flanges, weld neck flange, and more.